Home » Research » The "1968 Photographic Cars"
Ever since the 1967 Shelby G.T. 500 Convertible was first discovered by Jamie Ventrella in 1977, and later confirmed by SAAC to be the only one built, it was believed that the convertible's one-off status was attributable to being a "prototype." That theory, while plausible, led people to believe that Shelby American was responsible for designing the '68 Shelby G.T. and that two 1968 G.T. "prototypes," a Fastback and a Convertible, were built. After nearly a decade of research, we can now confirm that this theory was incorrect. THESE TWO SHELBY G.T. CARS WERE NOT "1968 PROTOTYPES." In an effort to fix all the problems associated with the '67 Shelby G.T. 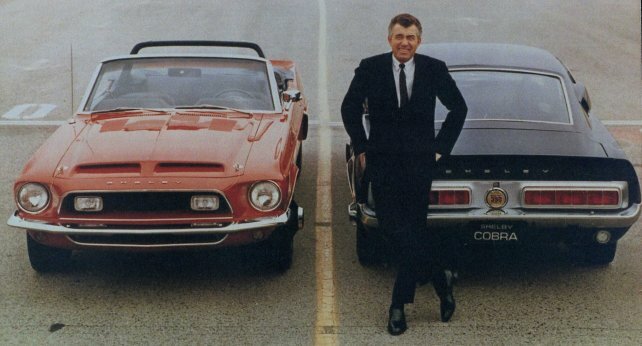 design, It was Ford that actually penned the '68 and then tasked the Ionia, MI-based A.O. Smith Plastics to fabricate two sets of hand-built fiberglass components, including a front-end, hood, rear tail light panel and center console. Circa March 1967, A.O. Smith shipped these parts to California (see item #4 in the VanAkin letter). Shelby American did not design, nor did they prototype the 1968 model year G.T. cars. By the time the California operation received Smith's parts, Ford's '68 design had been well-finalized. Shelby American was simply instructed to use these fiberglass components to update/modify two 1967 model year vehicles, a Fastback and a Convertible, for "photographic purposes." Once updated, the two cars were taken to several Southern California locations. By the time these cars were unveiled to the press at Ford's Long Lead Technical Conference on July 7, 1967, Ford had already made the decision (April/May 1967) to terminate the California-based Shelby Program.